As with many folks I am eagerly waiting for the return of Mad Men tonight. It has been too long. This weekend I am watching several episodes from last season to get caught up. No, I am not writing a post on the leadership approach by Don Draper (main character), but hum … someday. What caught my eye was a scene where Faye told Don a story to make a point about persuasion. It was an old-fashioned fable as in an Aesop Fable from when we were kids. When I looked up this fable online it is often labeled as a “Children’s Story”. Alas, we know better that this is a fable for us adults too. 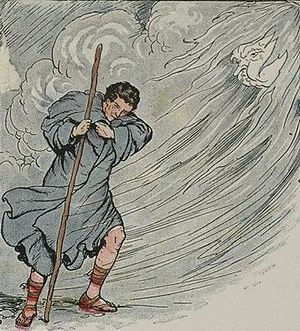 So the Sun retired behind a cloud, and the Wind began to blow as hard as it could upon the traveler. But the harder he blew the more closely did the traveler wrap his cloak round him, till at last the Wind had to give up in despair. 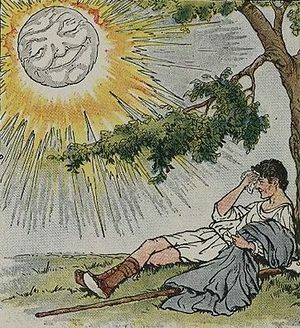 Then the Sun came out and shone in all his glory upon the traveler, who soon found it too hot to walk with his cloak on. This reminds me of two things. The first is a core influence for me concerning my education as an anthropologist. While I moved into business vs. the jungle (wait, is there a difference) I held onto my learning in anthropology. From this grounding I have a standing belief that we have forgotten more than we have learned. We are searching today as leaders for the next thing or discovery. Well maybe it has been with us all along as in how to interact with people and gain their support to influence their behavior (the sun in our fable) and be a leader. The second thing I am reminded of is my attachment to “Push vs. Pull”. I get this from my studies of Systems Thinking once I entered grad school and got serious about studying organizational development. You see the connection too – the Wind Pushes, the Sun Pulls. While leaders have to know when to push, our base approach needs to align with behaviors associated with pulling folks forward. How will you get someone to take off their cloak today? Great post this morning! I welcome both the sun and wind as they work in tandem together…. the sun warms and makes things clean and grow and the wind cools and blows away the impurities as well as throwing seeds and planting life……we need it all! I really enjoyed that last line “While leaders have to know when to push, our base approach needs to align with behaviors associated with pulling folks forward.” I may just have to add that to my list of great quotes. I think its interesting, going through many different subjects in school as I am now, I realize that when you go into these classes to learn about subjects(even ones that initially seem irrelevant to my career goals), I feel as though I learn equal or more knowledge about myself and life around me. I believe almost every subject has some core values or systems that can be applied to other aspects of my life and give me a unique perspective that seems to turn on “light bulbs” that weren’t on before. All of these principles, values, and systems that we recognize give us a better understanding of people as a whole and what makes them stop or go..push or pull. With this knowledge we are able to become leaders as we are able to see deeper into those who follow us and give us the tools to carve the path ahead. Thanks for the comments Isa. Yes, step forward, create the path and the pull for others will take care of itself.